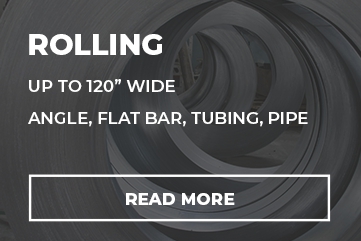 With over 20 years of sheet metal rolling experience, VeriForm has the expertise and equipment to deliver your rolled sheet metal products on time and on spec. 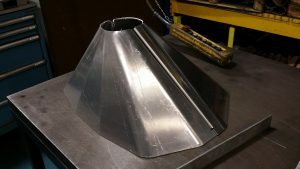 Very complex conical part that was both rolled and formed to create a transition piece going from a round to a multi-face opening. This was done from 1/8 inch thick 5052 grade aluminum. 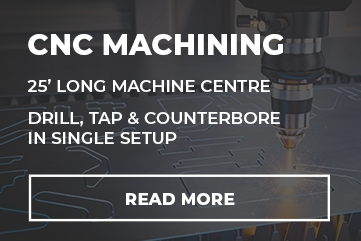 Following is a 1/8 inch thick aluminium corner sign section rolled with an acute 2 inch radius nearly 180 degrees. 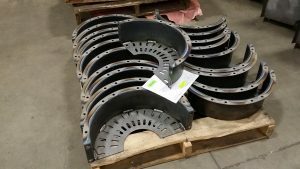 These are gear shrouds and guards rolled from 1/8 inch thick steel and welded for installation on a mining truck. 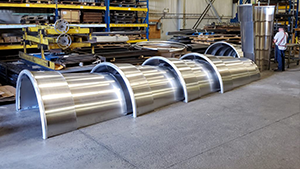 These 1/8 inch thick stainless mold sections are used in the glass industry for melting glass sheets into complex curved shapes. This photo shows a large 220 inch long sheet being rolled using a 2 hook lifting system to roll a half circle with a diameter of 172 inches. 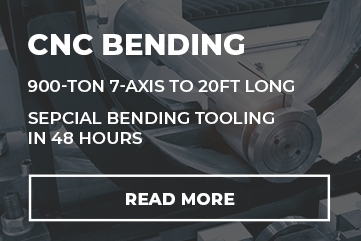 The material was very light and had to be carefully controlled to ensure the radius was consistent throughout the part length. 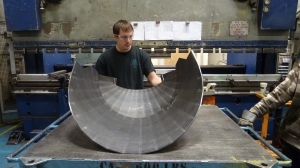 The material was 0.25 inch thick 316 stainless 2B finish so extra care was taken to clean the rolls prior to handling. 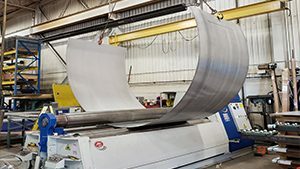 Here is a very interesting architectural project where VeriForm was contracted to build six 8 and 10-foot cups from 5052-grade aluminum sheet metal and the work involved laser cutting, rolling and welding to create artistic renderings of mega-sized cups once painted. 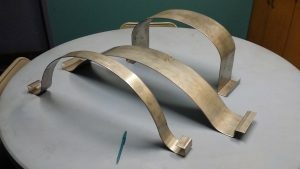 The cups were made in halves and then bolted together. 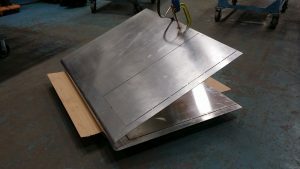 Questions About Our Sheet Metal Rolling? Contact Us & Get Answers!